Welcome to our world of Home Improvement. Possibly you have already walked around several showrooms, read your 20th brochure and thinking you are no closer to achieving your dreams?. O. K. been there, done that, got the T-shirt. Yes we really do know what its like and understand your problems. 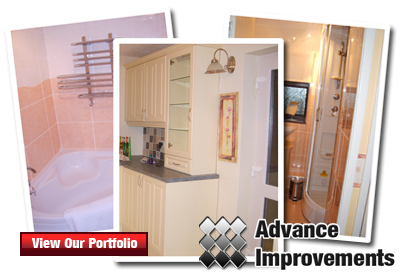 Advance Improvements have been trading since 1998, but have experiences stretching a decade beyond that. We are a small family business that work with you to help you to achieve what you want as close to your budget as possible. How do we do this? well our biggest strength is that we owe business allegiances to NOBODY. This means that all of our advice has to be completely impartial. Does this mean that we can't obtain big discounts on certain Kitchen/Bathroom items that the 'Big Boys' can - or certain internet providers can? In a word yes, but that doesn't mean that you can't obtain bargains for yourself and we can still fit for you. Just a word of caution though, sometimes bargains are not all they seem, that's where part of our free impartial advice comes in. Does this mean that I/We have to start trawling Shops/Showrooms/Brochures again? No. We can supply you with everything, kitchens/Bathrooms/Bedrooms/Tiles/Appliances/Advice without you leaving the comfort of your front room. Its just that everybody is different, have different requirements and we match everybody's needs on a personal level. Oh, well here we go. If I read a newspaper everyday I find our supermarket is lowest on this, another is the lowest on that and that another is the fastest growing budget retailer and so on, on & on. Our prices are better than most, so they should be, we don't run a showroom or employ an army of managers, designers or fitters. One thing we guarantee is that once we give you a price for the work that is it fixed, no hidden increases lurking before the final payment. On this site you will find average prices for work that we regularly do. These are a guide subject to a site visit and as above, once agreed the price remains fixed. Don't be frightened either, on return visits, we often find that, with the right finishing touches, some of our cheapest installations would be at home in a showroom. As specialist as you want to go, from a humble 6 inch white tile to high spec Porcelain & Travertine. Is it worth paying the difference? sometimes it is, sometimes it isn't. Imagination and flair can often keep some of your money in your wallet. We carry a limited range of floor and wall tiles to satisfy most requirements and budgets. If you require a wider range we offer discounts to East Midlands premier supplier. So whether you want a Bathroom, Kitchen, Porch or Conservatory tiling please ring or email for a visit and free quote.